Alabama. Water descends over the text. There are two reasons the claim that solar power is undesirable from low-income communities’ perspective is false, according to the policy guide. First, renewable portfolio standards (RPSs) create economic benefits for communities. Second, policies can ensure energy affordability once an RPS is in place. States with RPSs are achieving competitive results, the guide says. It cites data from Michigan, North Carolina, Minnesota, Rhode Island, and Oregon. These numbers show RPSs resulted in cost increases that were minimal at most for customers in these states. The exact terms and results varied. In some cases, costs went down. This program has become more visible this year, but it has been in operation for close to a decade. NAACP founded its Environmental and Climate Justice program in 2009, according to the “Just Energy Policies and Practices Action Toolkit” that it published in 2017. Energy decisions can have severe impacts on the communities that NAACP serves. Disproportionately, African Americans are more likely to live near coal, biomass or nuclear power plants. According to the toolkit, around 68 percent of them live or have lived within 30 miles of a coal-fired power plant. This leads NAACP to take a strong interest in the transition toward clean energy. Toxins that these power plants emit can include lead, asbestos, mercury, arsenic, sulfur dioxide, and nitrogen oxide. Birth defects, heart disease, asthma attacks, lung disease, learning difficulties, and cancer risks increase in communities that live near coal-fired power plants. “Our approach is very simple. Our strategy is the same as its always been in NAACP - community education and empowerment,” Franklin said. In practical terms, the toolkit recommends starting community-owned renewable energy projects, energy cooperatives, and energy efficiency projects. This last category could include weatherization or retrofitting. Like other advocacy organizations, NAACP has written sample policies for states. It is unclear how many states are interested in adopting them due to the guide’s publication. The information in the table below was published in the policy guide in March 2017. Some state policies may have changed since then. The guide also recommends community-benefit agreements, community-shared solar, building-energy-code policies, and performance-based rates. Performance-based rates are intended to remove the incentive for utilities to build unnecessary infrastructure and pass costs on to customers. One overall critique of this guide would be that it takes a hard line on seeking to reduce utility profits. This includes saying that distributed generation should be owned by communities and cooperatives rather than being built by investor-owned utilities. “Much of the major pushback has been from larger utilities and the fossil fuel industry,” Franklin said. This strategy of promoting community ownership and deemphasizing utility interests may ruffle feathers among stakeholders who have not previously included NAACP in their policy discussions. This appears to be no accident. It’s an assertive nonprofit-driven attempt to diversify the base of stakeholders whose voices are heard in the energy industry. The policy guide says that according to the American Association of Blacks in Energy, African Americans spent $40 billion on energy in 2009. Meanwhile, they only collected 0.001 percent of the revenue that the energy industry generates. Also, only 1.1 percent of them held energy jobs. These policy recommendations are targeted toward shifting the balance of power so that more African Americans can participate in the work and share the profits of the energy industry. Some solar stakeholders have been very motivated to participate. Grid Alternatives, Vote Solar, Solar Energy Industries Association, and other organizations have stepped up to partner with NAACP. NAACP’s work to distribute the financial benefits of clean energy includes supporting hiring people with prison records. 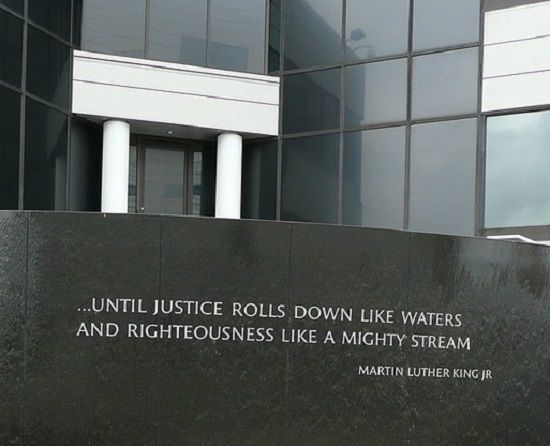 The Los Angeles program participated in a recent event on Martin Luther King Jr. Day that announced the national campaign to expand NAACP’s energy justice work via its solar equity initiative.